I love weddings. For the longest time, I have had a strong desire to make people happy. It started with writing a book about the romantic charms of the San Francisco Bay Area and eventually grew into a business, Romantic Celebrations, that my wife and I own together. Through assisting thousands of people with celebrating anniversaries, honeymoons and marriage proposals, we began to work with couples to make wedding arrangements. I have been officiating weddings since 2009. Thank you for thinking of me to be a part of your special celebration. Weddings and vow renewals are two of the most romantic times of your life. My goal is to give you a memorable, creative, fun ceremony that you will remember forever. Please fill out my contact form to check availability or contact me at 831-601-1650 or at brian@montereybayweddingofficiants.com. Resident of Monterey County since 1993 and lifelong Californian. Graduate of Dale Carnegieʼs Public Speaking Course, an intensive 8 week program. Owner of Romantic Celebrations (2006), a company that helps people to celebrate anniversaries and honeymoons. We have also assisted with over 400 creative marriage proposals. I have been officiating weddings since June, 2009 (wedding parties ranging from an elopement up to larger weddings with over 300 in attendance). As of September, 2018, I have officiated over 1,000 ceremonies. I love weddings! I am a non-denominational wedding officiant. 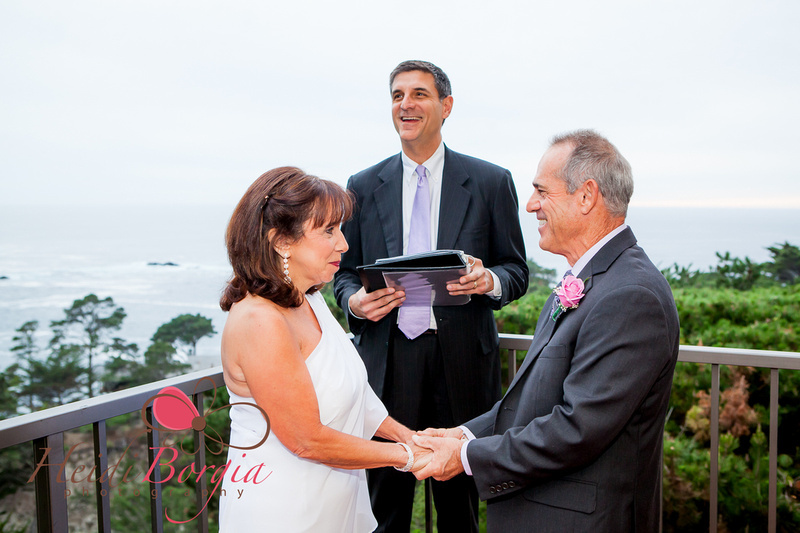 Most of my wedding ceremonies are customized and I provide you with a copy of it before the ceremony takes place. I have had experience as both an event planner and wedding coordinator. If you ever need any advice or need any extra assistance, just let me know how I can help. With me, you are getting both an officiant and someone that can help you in the wedding planning process. ​We originally booked with a different agency and well long story short they were unprofessional, I cancelled with them and found Weddings in Monterey, Brian was quick to get back to me, answer all of my questions, he's very kind and very professional. The day of the ceremony he was there early and very nicely dressed and clean cut, the bamboo arch was set up beautifully and my bouquet was exactly what I wanted. When it was time for the photographer to get pictures of just me and my husband my kids were not cooperating (I have a 6yr old and a 2yr old) Brian stayed and played with them so that we can take pictures, that was very sweet of him to do, I highly recommend him! Everything went so perfect. - For a beach wedding, the wedding planner had brought a microphone for me to use. While testing it, I noticed that it kept going in and out (faulty cord) and that with the wind passing through the microphone, it was better to "strike" the sound system. I was able to project to a group of 80 people on the beach and just 20 feet from the surf. A guest from the last row of chairs came up to me afterwards to thank me for speaking loudly and clearly. - A wedding at a beautiful, historic place in Monterey, had a four post bamboo arch and decorated with flowers and beautiful draping. I always stand up at the altar long before the wedding begins to make sure everything feels comfortable and looks right. In this case, there were vines hanging down (which would have been in front of the bride and grooms faces) and the drape extended down the middle by several feet (for photography, all of the photos would have had what appeared to be a headless officiant). With the help of the staff, we fixed these issues to make sure the ceremony photos would look just right. - A couple had hired our wedding company to set up the ceremony and they decided to use their family member to officiate. Just a few days prior to the wedding, their officiant decided he didn't want to do the ceremony after all (nerves), but I was able to put together their ceremony and conduct the wedding. During the first 6 months of 2018, I have had 3 couples hire me last minute due to family members / friends not being able to officiate after all. These are just a few examples. Weddings are meant to be a celebration and sometimes things will go wrong. What is most important is that you are professing your love to each other and sharing that love with your guests. One of my jobs is to provide you with a beautiful ceremony, and to minimize any small mishaps that may take place (and keep you stress free).